I knew my cousin, Alec Tearle, although only slightly. He rang me once in New Zealand, and I remarked then on his beautiful, cathedral-filling, gravelly voice, with perfect diction. 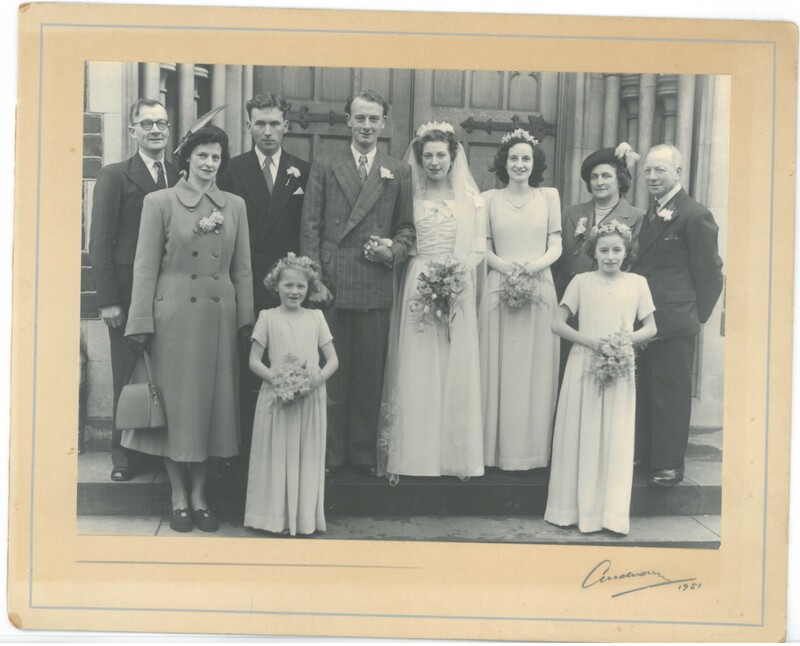 He and his wife Beryl took us to a wedding in Langtoft, Lincolnshire, where they were in the church choir for the ceremony. He modestly called himself a “wedding singer,” and he had an effortless baritone. He told me one story of his military life. He had just been promoted to Base Commander of an aerodrome where he was in charge of the Queen’s Flight. His first morning in the control tower was cold and foggy, but as the fog lifted and the tower began to count down to the first of many flights that morning, he saw a small woman in a tweed coat walking a dog on the macadam. In 1946, immediately after WW2, RAF Benson hosted Kings Flight; it became the Queens Flight in 1952. That Alec was in charge of Queens Flight means this incident occurred at RAF Benson. Queens Flight was disbanded in 1995 to become part of No.32 Squadron at RAF Northolt. Alec’s MBE was notified in a Supplement to The London Gazette of 3rd June 1972, page 6261. A. R. TEARLE, M.B.E. (4025695). M.I.E.R.E., M.R.Ae.S., 10th Jul. 1984. BULLOCK, Bi.Sc. (504033H), llth Jul. 1984. M.B.IM. (3035291J), 20th Jui. 1984.
own request), 14th Jul. 1984. At one stage, he was the president of the Langtoft and Deepings branch of the Royal British Legion. 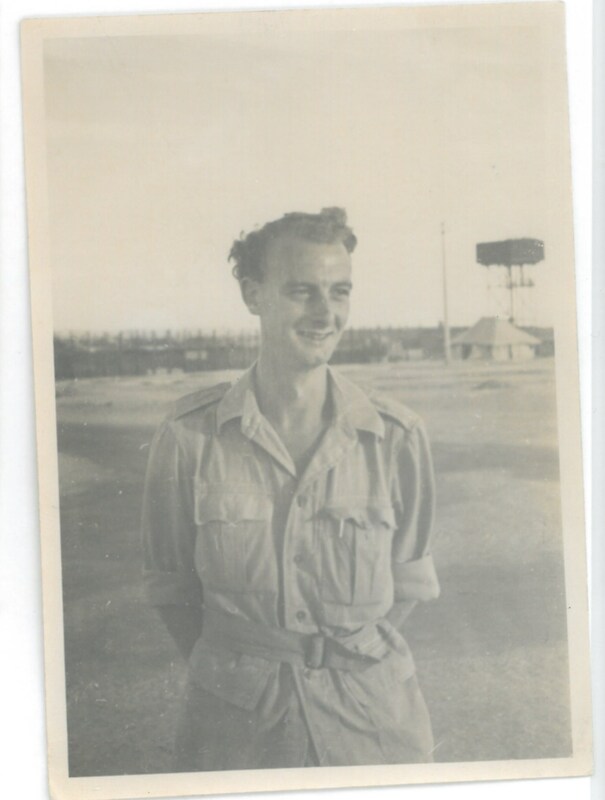 TEARLE Sqn.Ldr Alec M.B.E. 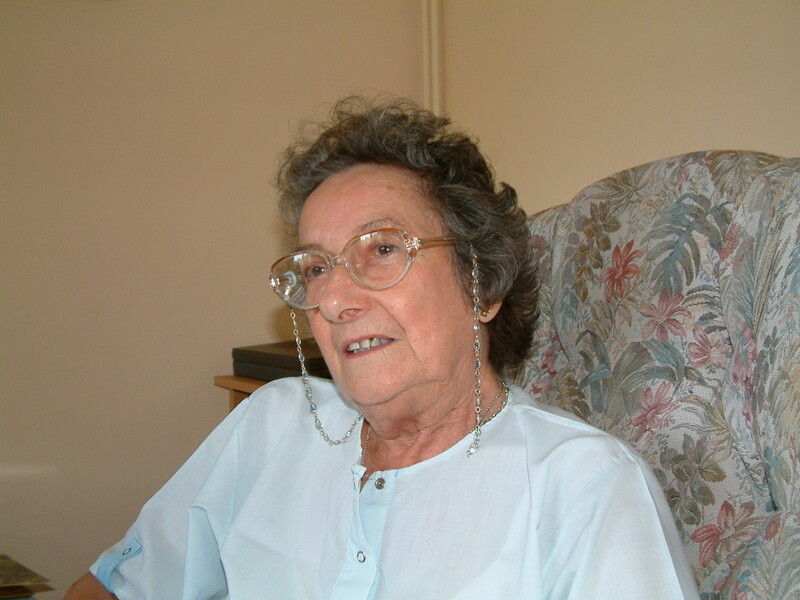 (ret’d) passed away peacefully at Peterborough City Hospital on 22nd December 2015, aged 86 years. Dearly beloved husband of Beryl, treasured father of Stephanie, Simon and Timothy and beloved grandfather of Gemma, Andrew, Elizabeth and James. He will be sadly missed by all his devoted family and friends. The funeral service will take place on Tuesday 12th January 2016 at 12.00 (noon) at Peterborough Crematorium, Marholm. 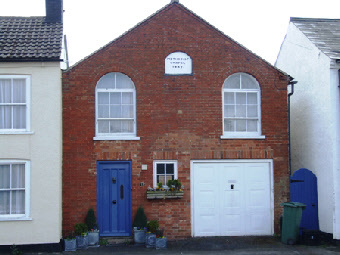 In recent years Alec and Beryl lived in Langtoft, Lincolnshire, a small village just outside of the picturesque market town of Market Deeping strangely enough just inside Cambridgeshire. They enjoyed a significant number of years in happy retirement, being active in the local Church, the local village hall and events therein. Their garden, their pride and joy, an oasis of colour and scent in the Flat Lands of the Fens. 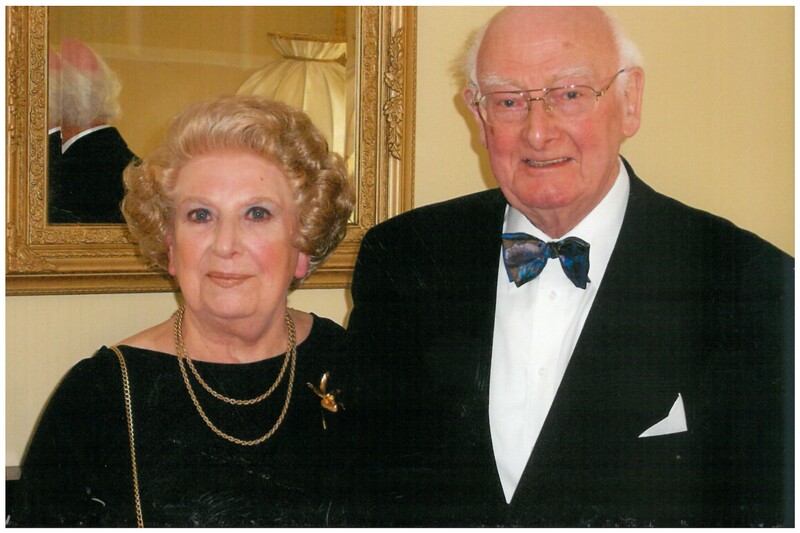 It is with sadness that we, Stephanie, Simon, Timothy and our wonderful mother Beryl, lost Alec to a brief but troubling illness in December 2015. He passed away peacefully at Peterborough General Hospital 22nd Dec 2015. Father was an incredible man of quiet nature, but huge achievements. His engineering skills embraced the introduction of modern technology to the Royal Air Force, seeing the transition from the most advanced Piston Engine Propulsion, to the fledgling, and latterly the high tech world of supersonic jet propulsion. Being a unique man, his craft of Air-Frame and Engines meant that he was frequently called upon to pioneer procedures on the new fighters, bombers and specialist aircraft entering service with the Royal Air Force throughout the 1950’s and well into the 80’s. His grasp of engineering led him to refurbishing and re-commissioning a gas production plant in Bahrain. This enabled the Armed Services to have valuable assets in terms of liquid gasses at their disposal in an area where tensions were ever fraught, and the constant supply of liquid gasses essential to the operational capabilities of both maritime and airborne services in the Middle East during the 1970’s. 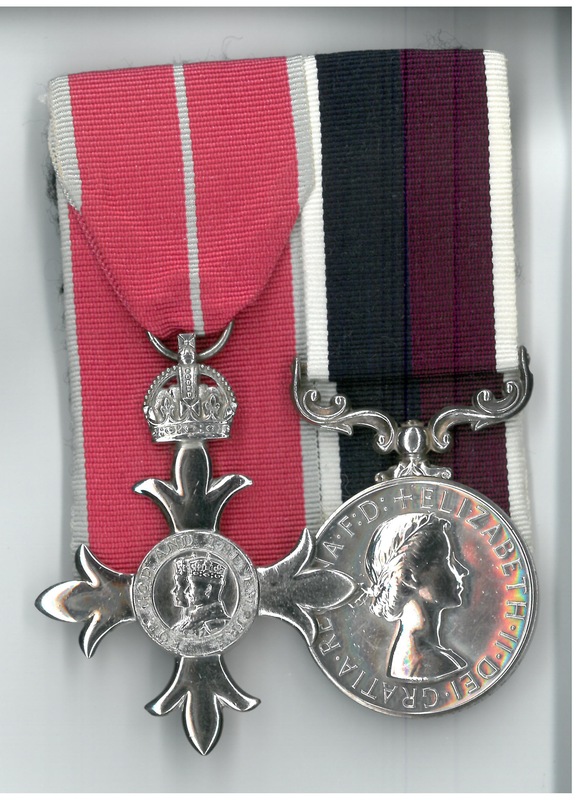 This successful project, together with work on the Island’s only power plant, (4 Rolls Royce Aero engines converted for running on gas) to secure a constant and uninterrupted power supply to the Island, were recognised with the award of his MBE. There are many other major achievements that we children know too little about to list in any detail! He was born to Harry and Millicent, 15th June 1929 in Wing, Bucks, the eldest of their children, and brother to Thelma (Sheppard), Roy (who died very young from TB), Denis and “little” Rachel. On the 20th Jan 1951, he was married to Beryl Jean Proctor at St. Barnabas Church, Leighton Buzzard, Bedfordshire. Their love and strength together enabled them to celebrate 64 years, and very nearly 65 years of marriage before his passing. During their life together they lived a happy and varied life, encompassing over-seas postings, periods of enforced separation, and very many moves at the behest of the Air Force. We children grew up in a happy, loving and, in a great many ways, privileged household. We enjoyed the trappings of Father’s continued successes most ably assisted by Mothers constant loving, support, and drive, to enable him to excel at every task he undertook. Beryl was lovingly cared for by Alec up to the final days before he went into hospital. Beryl in later years developed Vascular Dementia and the demands this uninvited condition placed upon Alec were considerable. He did, however, deal with it as with everything in his life, stoically and with love, tenderness, compassion and considerable good humour. Proving how even at this most delicate and demanding of tasks, he excelled. Beryl is now living close to Stephanie and Simon in Oxfordshire, close to RAF Benson where Alec was stationed as Ground Engineering Officer in the late 1970’s. We are all able to visit regularly and at time of writing, I am delighted to report that she is very well, comfortable and happy. 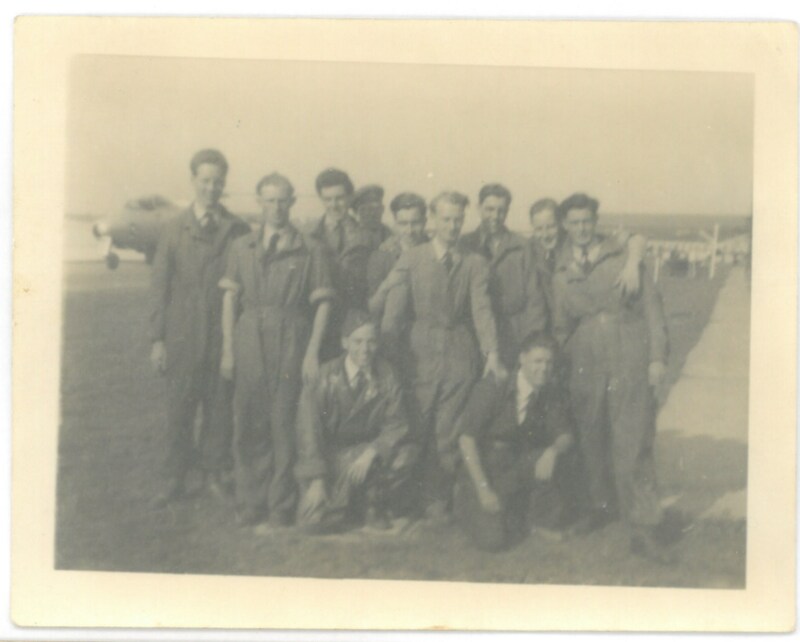 The photographs below are privately owned, and supplied by Tim Tearle, Alec’s son. If you compare Alec in his wedding photo above, with the photos of him below, then the first four photos were taken in the 1950s, but the location is unknown. Tim says that Alec was at RAF Benson in the late 1970s, and that is possibly the setting for the story of the “lady on the runway” because he would have had sufficient seniority to be in charge of Queens Flight. Gloster Meteor, the only jet fighter of the Allies in WW2, and the first civilian-registered jet aircraft in the world. Five Meteors worldwide are still airworthy. 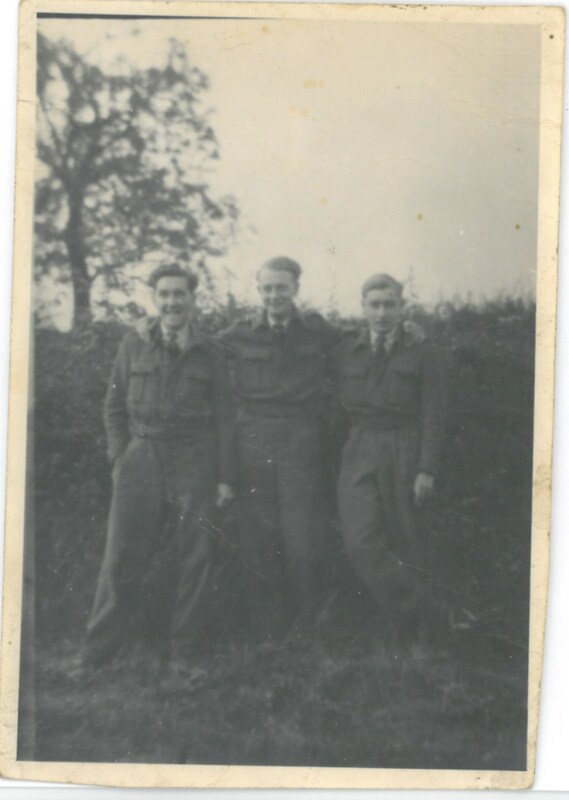 Alec, standing centre, with fellow engineers. 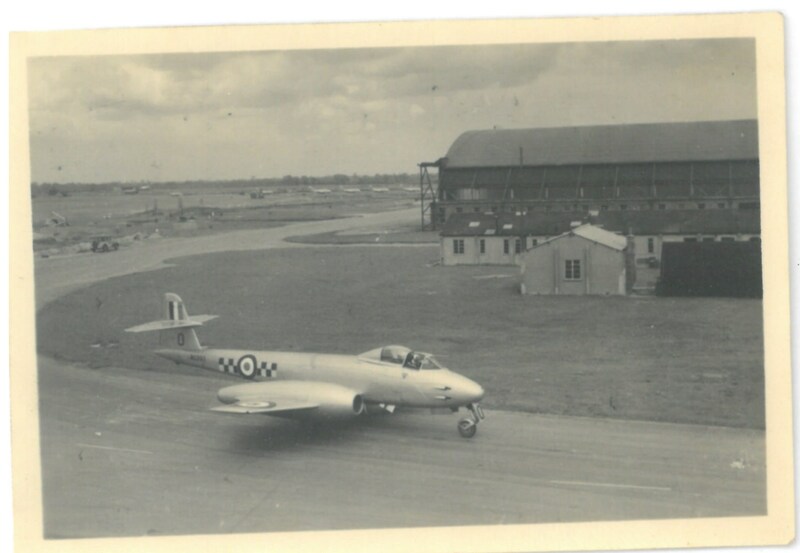 The aircraft in the background looks like a Gloster Meteor. 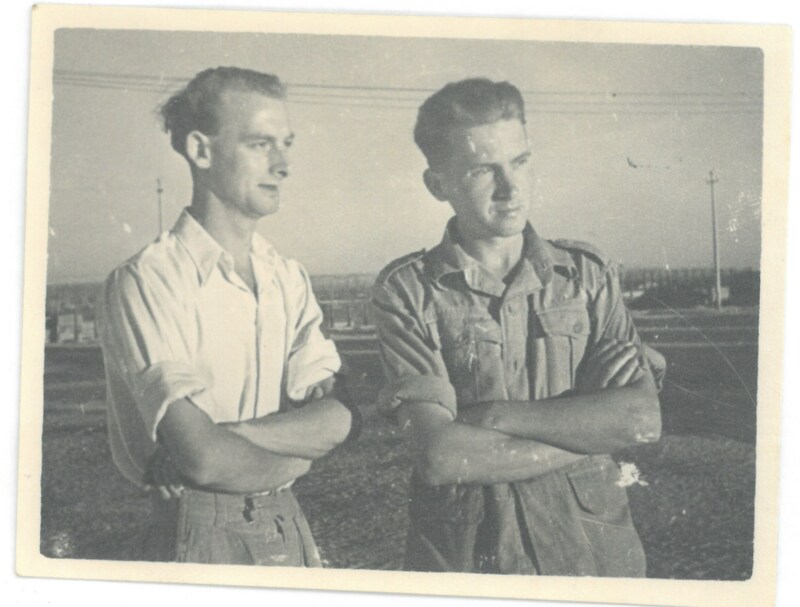 Thanks to Tim Tearle for sending me the resources above with the request that I write an article about his father. Without Tim’s help, there would have been no story. Thanks also to Barbara Tearle of Oxford who alerted me to the London Gazette postings, above. I suppose Wing wouldn’t immediately spring to mind as a hotbed of Tearle activity, but this ancient little village, just over the border in Buckinghamshire from Leighton Buzzard, became a very busy spot when a blacksmith and his brother moved to Wing in the late 19thC to set up their houses and bring up their families. 133 years later, Tearles still live in Wing. 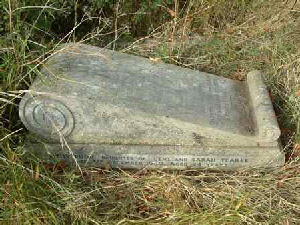 Below is the headstone for my g-grandfather, Levi, b27 July 1850 in Stanbridge and his wife, Sarah nee Blake b24 Aug 1851 also in Stanbridge. These are some of Levi and Sarah’s children. but Levi and his family were Methodists and attended the Methodist chapel (above right) down the road in Church St, where Levi was the superintendent of the Primitive Methodist Sunday School. This is now a private dwelling. 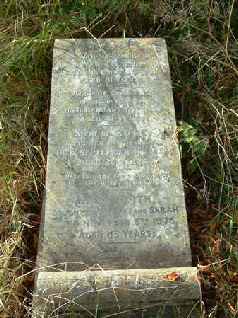 Levi and Sarah were married by banns in Stanbridge on 23 Mar 1874. Their son, Arthur, my grandfather, was born in Wing that December 24th. 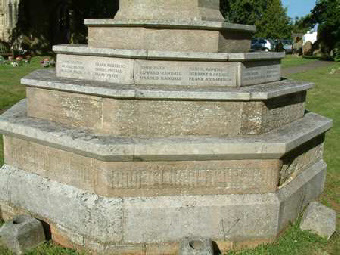 Levi’s parents were James b1827 Toddington and Mary nee Andrews of Eggington. James parents were Thomas 1807 and Mary nee Garner. Thomas’ parents were Richard 1773 and Elizabeth nee Bodsworth. Richard’s parents were John 1741 and Martha nee Archer. Thus Levi is of the branch John 1741. Levi and Sarah, my great-grandparents. Levi and his grown-up family. Rear row, Levi, Ellen and Mahlon. Front row, right to left; Ruth, Emily, Minnie and Edith. I suppose memorials don’t always have to have a name on them. Apart from the beautiful house he built in Wing, Levi’s lasting memorial will be the fencing he made for the property around Ascott House, Wing. This is the cricket ground fence. 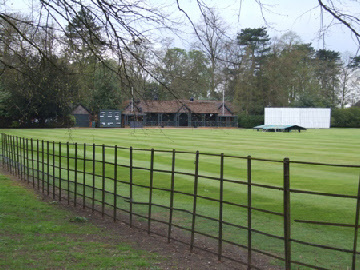 Cricket ground with fence built by Levi. Here is his house which he built in Stewkley Rd. In 1901, the Big House (the one on the left) was not built and Levi and family, including my grandfather, Arthur, were living in the cottage in the middle. 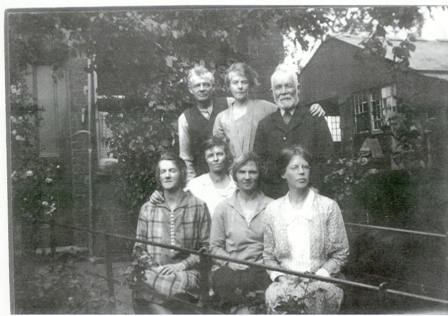 The painted cottage contained Mr and Mrs Cutler and family. 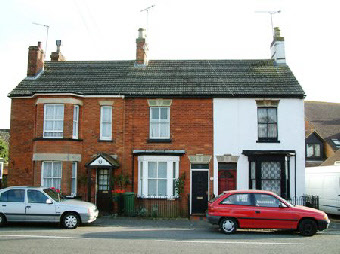 Jennie Pugh of Luton says that the house next door to that always contained the chauffeur from Ascott Hs and the Rothschilds sent the children of the chauffeur to a school in Leighton Buzzard that charged £3.00 per term. As far as I know, Levi did not build the two cottages, but Jennie says he did carve Ebenezer Cottages into their window sills, named after a (Methodist preacher?) friend of his. 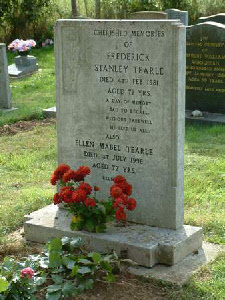 The little tablet briefly records the family of Harry Tearle b1908 in Wing. He was a son of Mahlon and grandson of Levi. He married Millicent Green, from a very long-standing Wing family. 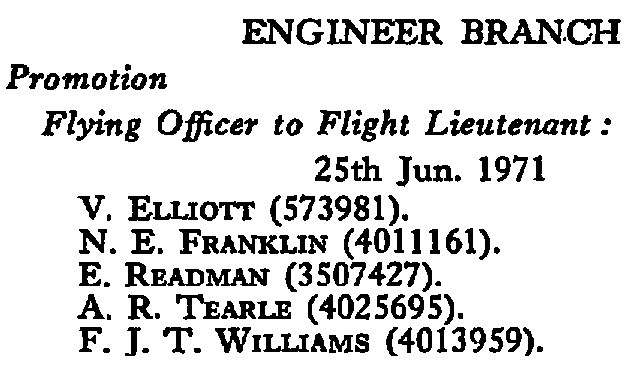 They and two of their children – Roy, who died only nine years old and Thelma – all of whom died in Wing, are listed here. 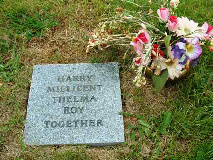 Thelma is actually buried in another section of the churchyard and here is her tablet. Emily, Mahlon’s sister, also has a sad story. In 1913 she married John Pugh, a butler, and had a son Ernest b1915, Wing. John Pugh joined the war in 1915 and lived and fought through it all as a sergeant machine gunner until just three months before the war ended. Here he is, on the war memorial in the Wing churchyard. Emily stayed in Wing for the rest of her life, working as a maid for one of the local families. 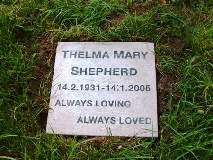 She is remembered on Levi’s headstone, above. Martha Timms lived across the Tilsworth Road from Amos when they were growing up in Stanbridge. 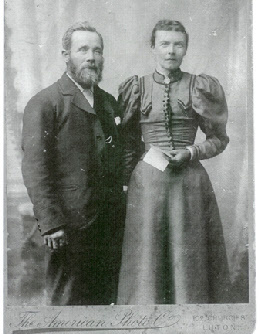 They married in St Johns Stanbridge on 18 July 1881 and moved to Wing soon after Levi, Amos’ elder brother, set up the smithy there. Amos was the blacksmith’s assistant until Levi’s son, Mahlon, took over the job. 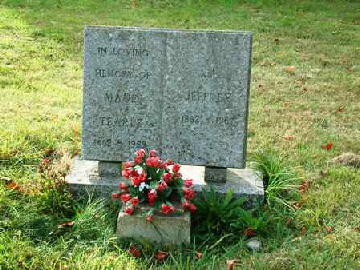 There is no memorial in Wing to Amos or Martha, but here is the headstone for Jeffrey, Amos’ first son and his wife, Maud nee Cutler. Amos and his family are, of course, on the branch of John 1741. This memorial is for Jeffrey’s son, Fred. 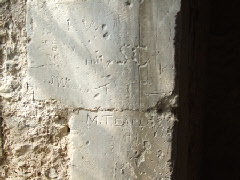 Strictly speaking, the graffiti in the clock tower, below may not be called a memorial at all. I am pretty certain it was carved by a young Mahlon Tearle, perhaps while he was mending something to do with the bells, or the clock. Some 20th Century graffiti on the wall near the church bells. There is a great deal of information about Wing on a site dedicated to it, and all the events that have happened there. Did you know, for instance, that when Levi lived in Wing, there were no fewer than three blacksmiths in the village – and at least one wheelwright. 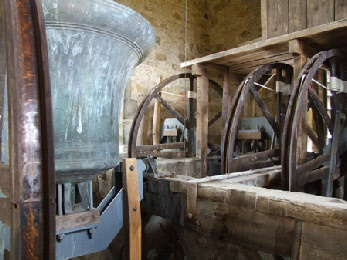 While we are there, here are the bells and mechanism he might have been repairing. 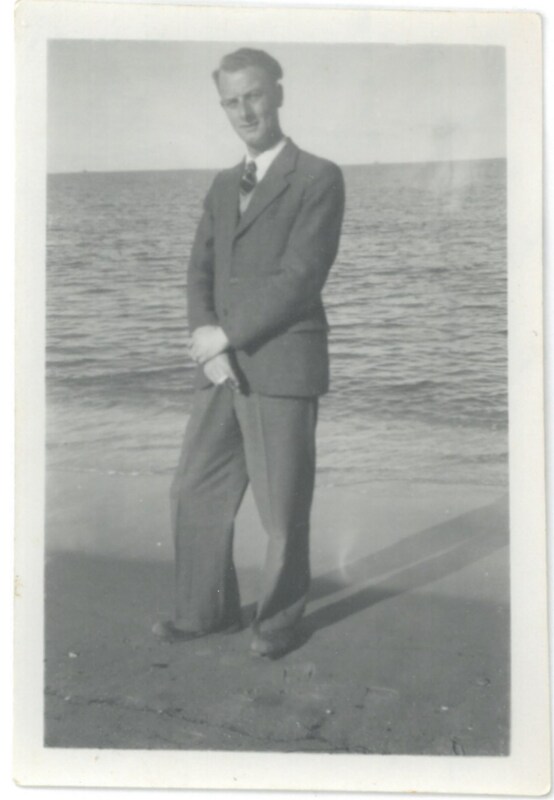 We were still living in New Zealand when I wrote to Barbara Tearle of Oxford in 1992 asking her if my grandfather Arthur Tearle had any brothers and sisters. She wrote back to say he had one brother and many sisters, and she would put an advertisement in the local paper to see if there were any members of that family still in the district. It was Thelma who wrote to me. She explained that she was the daughter of Harry Tearle of Wing, son of Mahlon who was the brother of my grand-father Arthur and they were both the sons of the blacksmith of Wing, Levi Tearle. From that letter came a lasting and deep friendship that I have enjoyed with my cousin, Thelma. We wrote letters, swapped cards and I even rang her a couple of times. She never forgot a birthday and she had a knack of getting a card to me on time, even though she may have sent it from England only three days before. She rang me once to say she had been allowed to buy her little house on the High Street in Wing that she had rented from the council for many years. Did I think she should buy it? I said “Definitely, it’s always better to own it than to rent it.” That Christmas she asked us to raise a toast to her as a newly propertied woman. In March 1994, our dear son Jason was tragically killed and it was Thelma who organized her aunt Clarice Pugsley and cousin Sheila Leng to go with her all the way to New Zealand in November that year to help us in our grief. It was Thelma who gave us the 6 walnuts from the tree in Jennie Pugh’s back yard, which was itself a son of the tree that grew in Levi’s garden in Wing, which in turn was grown from a walnut gathered from the tree which grew for his mother in Stanbridge. Elaine, Thelma, Clarice, Sheila, my mother Tia and my father Frank each planted one of the walnuts under the kitchen window of our house in Whawharua. Two of those walnuts grew into trees and both of them are planted in different places on our farm, a tribute to Levi Tearle and the wonderful family he had brought up. Two years later, my father and I transplanted one of the saplings to a special corner of the block set aside for the tree and the Rev Fred Day, retired, of Te Kuiti conducted a small ceremony entirely in Latin to dedicate the tree to Jason’s memory. It was Thelma, too, who held Elaine’s hand in the car on the long journey to collect Jason’s ashes in the urn from the funeral director’s studio and Thelma, Clarice and Sheila were there in Hamilton with Genevieve, our daughter and a small collection of family and friends when my younger brother sang “Let the Circle be Unbroken” as Elaine and I finally laid our beautiful son to rest. A special bond had been formed, a bond that would grow stronger with time. There was the wonderful reunion when they met my father for the first time. He and Mum came to Otorohanga for the formalities and saved us all the long trip to Hahei, and there were tears on the one hand and joy on the other, because my father was first cousin to Thelma’s father, Harry, and first cousin to Clarice herself. Arthur was much loved and much missed by his sisters. Elaine and I were working in Te Kuiti at the time and each day we would go to work and we would organize something for “The Girls” to do while we were away. One day a Te Kuiti businessman took them on a trip to the black sand beach at Mokau where they met up with a bus carrying marching girls on tour. The busload of marchers was so taken with Thelma, Clarice and Sheila having come so far, that they put on their marching display, in their lovely costumes, just for them. They sat in the sun on a giant log watching the marchers while Tony Pivac poured tea from a flask into plastic mugs on a blanket on the beach. It was a magical day. On another morning, we took them to the Waitomo Club where they met one of the local bowling enthusiasts and captain of his team, the best bowler in the Waitomo. When we came home Thelma, Clarice and Sheila were sitting on the pool deck in the late afternoon summer sun, swirling their legs in the cooling water, drinking New Zealand sauvignon blanc, laughing and shadow bowling and celebrating Sheila’s remarkable win. She had crushed them, every single Waitomo bowler who had dared challenge her; every one who had thought she was merely lucky with the way she bowled. No-one had told them Sheila was the Bedfordshire champion. They thought she was just an English girl! Thelma and Clarice had sat in the shade under the veranda of the Waitomo Bowls Club and watched their cousin play her beautiful shots with borrowed bowls; and they had laughed and cheered for Sheila and talked with these delightful Waitomo Club players who bought them cups of tea and cool glasses of lemonade all day long. It was one of the sunniest and happiest days of the many adventurous days that Thelma spent in New Zealand. That was after the day we took them on a trip along the Marokopa Road. We stopped briefly at the little Waitomo Caves School where Elaine used to be principal. We took a ride in a cave boat inside the Waitomo Caves and Thelma sat there utterly in awe, revelling in every minute of looking up at the thousands of beautiful glowing pin-pricks of light and being most impressed at how handsome and polite the young chap was who rowed the boat and helped her in and out. We drove to the Marokopa Falls and Thelma watched the thundering water and felt the spray – that was brave, too, she said. Then we walked from the road to the Natural Bridge and along a narrow path beside a clear, cold stream. That was brave, too. We walked along the black sands of Marokopa Beach, dug fossils from the mudstone and listened to the thunderous roar of the Marokopa surf. That was brave, too. She was loving being an outdoors girl. We stopped at the Waitomo Hotel on the way home and had a cup of tea, just so we could go inside and sample its Olde Worlde elegance. It’s a late Victorian kauri building in a Regency style perched on top of a limestone cliff with a panoramic view over a pretty valley full of native bush. Thelma stood in the open glass doors and drank in the view while she told me how much she loved being in New Zealand. She would emigrate here and we could all live in the sunshine and she wouldn’t have to freeze in the bitter English winters. That night we sat outside and had a glass of wine on the wooden steps of the house deck and Thelma looked up to see the Milky Way. “Where’s the Southern Cross?” I showed her where it was and how it pointed more or less to due south. “I have never seen so many stars.” During the time she was there, she would sit on the deck overlooking the farm and admire the skill and sheer hard work of Hurricane Jimmy, as they called him, the farmer who looks after our block. They admired his tractor work and he would come over to see them sitting on the deck and swap stories with them about his time on holidays in England and what they were doing on their holiday in New Zealand. Thelma talked about Hurricane Jimmy for years. For the whole time they stayed with us a tui visited the flax flowers and sang his beautiful melodies. A tui is a thrush-sized native bird, glistening black with a white tuft of feathers at the throat and a remarkable song of great clarity and purity of tone, distinguished from his imitators by a self-deprecating little cough at the end. They were totally charmed by this beautiful bird and considered themselves blessed. When we saw them off at the airport it was in the knowledge, the certain knowledge, that we would see them again. Our English family was not a myth; it was real, and the people we had met – Thelma, Clarice and Sheila – were some of the loveliest people we had ever met. Elaine and I moved to England in 1999 and between then and now, Elaine’s friendship with Thelma has deepened into an enduring love. Elaine and Thelma dropped into a routine of contacting each other before the school holidays and Thelma would plan a trip they could take together. One year, she was feeling very lonely and asked us to take her to see Clarice. We drove down to Ilfracombe and Thelma stayed with Clarice while Elaine and I stayed in one of Clarice’s cottages about 3 doors away in the same street. Thelma and Clarice were like schoolgirls again; they gossiped and laughed and dug out family photos until deep into the night. We took Thelma to Lynmouth and she and I rode the cable railway up to Linton. She and Clarice had a very tearful parting but they would see each other one more time. Clarice came up all the way from Ilfracombe to St Albans and Elaine took her and Thelma and Jennie Pugh to the Moat in Luton and it’s true that they never saw each other again. Thelma was so pleased that she had seen her beloved aunt. On other holidays, Thelma would sit happily in the passenger’s seat and guide Elaine through the narrow country lanes of Beds and Bucks and point out all the places she used to bike to and all the places she used to know and she would talk about all the people who used to live there. One holiday recently she took Elaine to Southwold and Great Yarmouth and they sat on a wooden bench overlooking the beach, wrapped in blankets while she watched the RAF trying to salvage a Harrier jet that had crashed off the beach. Not far away, a young chap in T-shirt and shorts was watching the scene through a telescope mounted on a tripod and he noticed her watching him intently. “Do you want to see the rescue?” he asked. “Oh,” she said, “Do you think I might?” For the week they were there, the news was full of this Harrier being salvaged, but Thelma had organized a ring-side seat. Each morning she and Elaine went to the beach, examined the scene through the telescope and talked knowledgeably to the owner about things military. After all, her brother was an RAF Squadron Leader with an MBE. “I was very brave,” she said, “I paddled in the North Sea. I could have been frozen, you know.” As she sat in the bus shelter with Elaine drying her feet, she collected quite a gathering of people who were happy to talk to this delightful old lady telling her story to her Kiwi companion. In a nearby café, she met people she knew from Wing. Later, she wanted fish and chips. Not any old fish and chips, mind, the ones in Great Yarmouth were not good enough. The only ones suitable were the fish and chips in Kessingland. There are rules about fish and chips; they have to be excellent quality and it’s not proper to pay too much. If the sign says the fish and chips are too expensive, you move on until a sign says the price is right. Thelma knew these things and Elaine loved her for it. A couple of days later, Thelma rang us to say she wanted to drive her red Ford Ka to Mentmore, did we think it was a good idea? 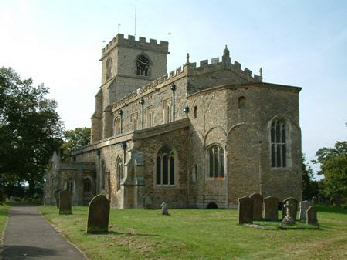 Elaine said, “If you feel you can make it, then, yes of course you should go.” Thelma later rang to say that she had taken exactly the same route she had taken with Elaine and had sat in her car and looked out over that beautiful valley all the way to the narrow, steep spire of Leighton Buzzard church. As far as we know it was the last time she drove her beloved little Ka. Thelma had a heart and a mind for the simple things; she had an encyclopaedic knowledge of English plants and of local history and yet she could play the high life as well. She was on the committee that vetted the people who would live in the Wing Almshouses. She took this job very seriously; my grandmother Sarah Jane Adams was brought up in the Wing Almshouses. On our last visit to see her in Stoke Mandeville Hospital, she told us how angry she was that the government was messing her pension about. Every time she went to hospital the pension stopped immediately, but it took weeks to get it started again when she got back home and that was a long and tiring business when it was so difficult for her to leave the house. Thelma was a woman of dignity and wonderful presence. She was intelligent and steeped in the knowledge of her family and mindful of her obligations to her friends, her mother and her village. She was a woman of rare character and great charm. She was a woman of the old school; gracious, generous and beautiful to the core. We shall not see her like again.